“We wanted a better understanding of the federal marketplace and the bid process and how all that works,” said Brandt (center in photo at right). 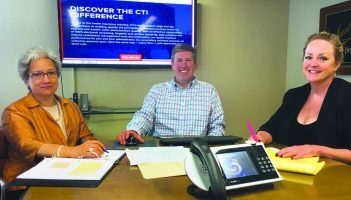 For CIRAS, the process begins with a computer, according to Jodi Essex, government contracting specialist with the CIRAS Procurement Technical Assistance Program (PTAP). Experts help companies register with specific government agencies so they can be notified when business opportunities are posted. Once a company is on all of the right lists, CIRAS bid-matching software helps businesses scour the Internet for other publicly posted opportunities. Then PTAP experts help companies find prime contractors who might be looking for subcontractors to share the work. The education process can take anywhere from a month to a year or more, depending on the size of a particular company, Essex said. Brandt said Essex helped his company identify several potentially lucrative federal contracts—but they’re contracts that won’t come up for bid for several years. So CTI plans to use that time to gear up for the long term. The firm is building its own database of government procurement officers to aid in future marketing, and it’s making sure that it can comply with federal rules governing things like information security. The plan is to position CTI so the company can put its best foot forward when the time comes to bid. For more information, contact Jodi Essex at jodir@iastate.edu or 515-509-0769.